Might it one day be possible to order local certificates from the GRO? 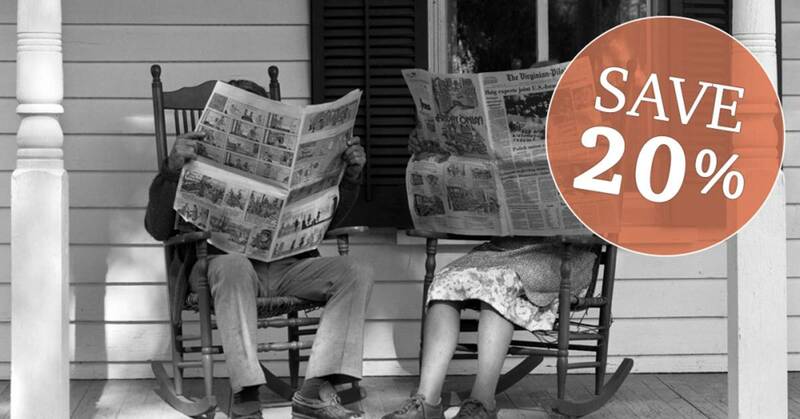 Between now and Wednesday 15th February you can save 20% on new Annual subscriptions to the British Newspaper Archive, which has hundreds of millions of articles from more than 720 British and Irish newspapers. It's an ever-expanding resource - just over 18 million pages have been digitised and indexed so far, but the target is an amazing 40 million pages. To take advantage of the offer follow this link (you'll also be supporting LostCousins, by the way). Whilst all of the articles in the archive are also available through the Findmypast site if you have a World subscription (a Britain or Ireland subscription offers access to newspapers from the respective islands), the search facility at the British Newspaper Archive site is far more powerful - try it! And, if you missed it, be sure to check out the article in the last issue about the new 'In Pictures' feature. Last year The Genealogist made available more than 2.1 million parish records (mostly baptisms) from Hampshire - they were released in partnership with Hampshire Genealogical Society. Now they've added another 280,000 parish records, this time from Essex, Cumberland, and Norfolk. Essex is of particular interest, because whilst images of the parish registers are online at Essex Ancestors there are no transcriptions at that site, and many of the registers have never been transcribed. Millions of other parish records will be added to The Genealogist during 2017. Tip: you can save £20 on a Diamond subscription to The Genealogist if you follow this link. I'm still receiving emails about a problem which I spotted and reported to the GRO in October (even before their online indexes were launched), and subsequently wrote about in three newsletters between 4th November and 9th December. One article was headed " What you really need to know about the GRO's new birth and death indexes", another "WARNING: Millions of incorrect ages in the new GRO death indexes", so they should have caught the eye of most readers. I'll briefly reprise the key points: in cases where the age at death was recorded in the register as X days, X weeks, or X months this number often appears in the indexes as if it is the age in years. For example, someone who died at the age of 22 months will at first sight appear to have died at the age of 22 years. This is bad news if you're searching for infant deaths, but at least you can make allowances once you're aware of the problem. And there's a positive side to the story too - once you've discovered the right entry you're getting a little bit of extra information that you wouldn't otherwise find out unless you ordered the certificate. The GRO are not only aware of the problem, they also have a warning on their website. Tip: the customised Google search at the top of each newsletter allows you to quickly find articles from past issues; in the unlikely event that you don't find the article you're looking for first time, try changing the wording. Phase 2 of the General Register Office's PDF trial has now closed - I don't suppose any LostCousins members used the £45 same-day service, which clearly wasn't aimed at family historians (I certainly didn't!). Phase 3 is much more likely to be of interest to us - this will provide PDF copies of register entries that have yet to be digitised at a price of £8. Whilst this is only a small saving in cost compared to a paper certificate (£9.25), it's potentially a big saving in time for those who live overseas. The start date hasn't been revealed - the GRO website currently states "Details of the commencement of phase 3 of the PDF pilot (PDF copies of our non-digitised records) will be published here shortly". If the launch date is announced before the next issue of this newsletter I'll add the information to the Stop Press below. I understand that Phase 3 will run for 4 weeks or until 40,000 orders have been placed. Because the GRO only has online indexes for events which have been digitised you'll need to source the references at FreeBMD (or one of the other sites that has indexed the entries) and input them during the ordering process. When phase 3 is over local registration services will be asked to provide information to the GRO about their sales of certificates during the period of the PDF Pilot, and to compare them with their projections as well as actual sales for the previous year. The GRO is committed to minimising the impact of any changes they make at national level on the local services, so let's hope this doesn't prevent them continuing the PDF service which so many of us have fond invaluable. The registers held by the General Register Office are copies of the registers held locally, so whether you order a certificate or a PDF from the GRO you won't see your ancestors' handwriting. The good news is that often the handwriting of the registrar (or the vicar, in the case of a church wedding) will be more legible than the original; the bad news is that an error may have been made during the copying process. When you order a certificate from a local register office they may be able to provide you with a facsimile of the original register entry showing the original handwriting- it depends whether they have the right equipment available. I suspect that most of us would prefer local certificates were it not for the fact that they're more expensive to buy, and more difficult to order. I've suggested to the GRO that it might be possible for them accept orders for local certificates via their website. I realise that it wouldn't be a trivial thing for them to implement, but if they did it would help to offset any negative impact from the new services that the GRO are offering - and, I suspect, the total number of certificates ordered would increase further. In December 2015 it was announced on the blog of the Parliamentary Archives that the Protestation Returns of 1641-42 (the closest thing we have to a census for this period in history) were in the process of being digitised, and that it was hoped to start uploading the images during 2016. This didn't happen, and I heard yesterday that this was the result of technical issues which have caused the plans to be put on hold for the time being. However it is possible to order images from the archives for "a small fee"; you can find out which returns are held using the map search that you will find here. At first sight the visitations are too good to be true. They are the pedigrees of all the landed gentry plus a few merchants from the 16th and 17th centuries at intervals of forty or fifty years and compiled by County. The answer to a family historian's dreams, all the genealogy done for you and ready to copy in to your own family tree. All you have to do is to go to Chris Phillip's excellent medieval genealogy site and grab hold of nearly all the volumes. The Heralds received Royal Commands to visit the counties and establish the coats of arms and pedigrees of those entitled to bear them (armigers). Mostly the heralds got lists of the candidates from the Sheriffs of each county and then either the sheriffs or the heralds would write and ask them to attend at points on the herald's proposed tour, or Visitation, of the county concerned. The armigers would be asked to bring with them some evidence like a seal or a written pedigree of descent of the arms. The heralds for later visitations would bring with them a copy of the earlier visitation which would make perhaps half of his task a little easier. The herald's task was to satisfy himself that the candidates had the right to their arms and that they knew who were next in line. The heralds had the right to disallow arms and some disallowing did happen. When the armiger and the herald got together, one has to imagine what they did. A pedigree might be produced. A sceptical herald might demand some evidence. But as the successful armiger would be paying a fee, it was in the herald's interest to give value for money and accept the possibly grubby pedigree without question. Certainly the evidence of some of the pedigrees is that the ones in the earlier, 16th century, visitations could be fanciful in the extreme. Why didn't the heralds do a proper job? The King, or Queen, paid them a stipend for their work, perhaps twenty or so pounds a year, was that not riches enough for them to do their job properly? But a proper job could only be done by reference to the deed chests or to the government Rolls, Inquisitions Post Mortem, or Feet of Fines. It was too risky to cart valuable deed chests around the country and in any case all the government records were in London or sometimes carted around in the wagon train of the sovereign. Quite simply it was impossible for the heralds to do a proper job. Then what did the armigers know? They were not lawyers, they could not understand their deeds and they had no idea about the Government Rolls. All they knew in reality was the names of the people who brought them up, their parents and possibly their grandparents. So their evidence for any pedigree laid before the herald could not go back any earlier than the candidate's grandfather. Anyhow some pedigree was written down and the armiger usually signed it. If you can find a document with a signature on it, it is either the original or a skilled copyist's copy of the signature or a forgery. Take your pick! The signed documents then went back to London and the College of Arms. Some of them are still there. A few were removed by persons unknown and have ended up in a prize collection. And many copies were made; some of the copies were scholarly copies, just that. Some of the copies included later material. Some of the copies include foreign material. The printed Visitations were made, almost without exception, and that was because the Original had escaped the College, from copies. Mostly the printed Visitations include a Preface in which the compiler gives information on which document he principally used as the source of his visitation. In the 19th century the compilers would not be allowed to use any surviving original in the College of Arms, later they were able to get their work checked against any originals or the Master College copy. Only in the last 30 years of so have the printed visitations been compiled from the College's master copies. And there are still some visitations for which no printed copy is available (Shropshire 1663 being a notable example of this problem). You must read the Preface or you will fail to be aware of the sometimes severe limitations of some of the printed versions. Mostly, then, the printed Visitations are neither primary Documents nor even Transcripts of such. Mostly they are secondary documents, much the same as the pedigrees in Burke's and Berry's volumes. This is not to say these secondary documents are of no use, they are: they give you suggestions of what to look for and what to try to find. So they can be called Finding Aids and should be referred to if any of your ancestors should turn out to be landowners of the 16th and 17th centuries. This article originated in response to a question in the Society of Genealogists mail discussion list. It also included a reference to esquires being attorneys. This is true in the USA to this day, a legal attorney is an esquire and I even believe there is some legal dictate on this practice. But in England esquires have never quite had this sort of rigid definition. I have seen various compilations of the people who may call themselves esquire. But I have never seen any official document that appoints someone to being an esquire, it just is not the way we operate. When I was born, it was the standard practice to call everyone esquire when writing to them. Now that practice has fallen by the wayside. Esquire means nothing. Until midnight on Valentine's Day readers in the US can save $20 on DNA tests from 23andMe.com by following this link. In the US 23andMe offer a choice between ancestry-only tests and tests which also provide health-related information - in the UK (which isn't included in this offer) only the combined tests are on offer - you can find out more on the UK site. Over 3000 LostCousins members currently use one or other of those email services as their primary email address - which means that they won't receive my newsletters after May, unless they update their My Details page with their new address. Are you one of them? But it isn't only the members who use these addresses themselves who will be affected - looking down my My Cousins page I can see that two of my cousins and one other relative use those addresses, so unless they update their My Details page I could lose touch with them! Tip: if you exchange email addresses with another member using your My Cousins page the address shown on your page will be automatically updated when the other person updates their My Details - it’s just one of the many reasons why you should exchange addresses in this way and not include your email address in a message. And, of course, it's not just the cousins you've met through my site who might be affected - I suggest you look through your address book to see if there are any contacts who use those addresses. EE are suggesting that their users switch to Gmail. That's actually a very good suggestion - Gmail may not be the only free email service around, but it seems to be the most reliable (it's the only webmail service that I use or would consider using). Tip: Gmail is not only very good at identifying spam, you can configure it to pick up email from other addresses if you wish. You can even send email via Gmail but have it appear that it was sent from one of your other addresses - this can be very handy if you're travelling. This book is subtitled "A Guide to One Place Studies", and as Janet Few is vice-chair of the Society for One-Place Studies and has over 30 years of experience in family and local history research, she is just the right person to be writing it! It may be only a slim volume - just under 100 pages - but it is crammed with invaluable advice. People set out on One-Place Studies for a variety of reasons, but as a family historian I would be sorely tempted to research the two adjoining Suffolk villages where so many of my ancestors were born, baptised, married, and buried. I'm sure that if I did I would discover a web of connections between my ancestors and many of the other inhabitants - I already know about some, of course, but without investigating more deeply I'll never spot the inevitable marriages to distant cousins. But until I read Janet Few's book I hadn't seriously considered embarking on a One-Place Study - so rather than simply recommend this book to anyone contemplating such a study, I believe that it is relevant to every family historian, since we all have villages, hamlets, streets and neighbourhoods that were home to our ancestors. Even if you don't embark on a One-Place Study after reading this book it's likely to inspire you to follow new lines of research - but if you do, remember that LostCousins can accommodate One-Place Studies, offering you the opportunity to link to others whose ancestors lived in the locality. When I bought this book at Amazon I was able to get a signed copy sent direct to me by the author - though this option wasn't available when I checked just now. The cover price is £7.95 - you're unlikely to find it any cheaper, but if one of the suppliers sells out you may find that it is much more expensive, especially if the publisher has run out of stock (in which case my advice is to wait for it to be reprinted). Weighing in at 7 pounds, Lost England isn't the sort of book that you'll read in bed, but nor will it stay unread on your coffee table - it is crammed with black and white photographs of an era that few of us will remember, but which most will have heard about from parents, grandparents, or great-grandparents. I haven't counted, but I reckon there must be around a thousand of them spread liberally over the book's 500-plus large format pages. Because they're organised geographically it's tempting to look for photos of the places we know well, and ignore the rest, but that would be a great shame - most of the scenes would have been common in towns and villages across the country. The book that's currently occupying most of my spare time is The Somme Legacy by MJ Lee, which was released on Kindle yesterday, and is the second book in the Jayne Sinclair series of genealogical mysteries (you'll find my review of the first book here). Sinclair is a former police officer, so her approach to genealogical investigations is a little different from mine, but most of the techniques she uses will be familiar to all of us. The story begins in July 1916, just a few weeks after my father was born, and a few months before his father headed off for France seeking revenge for the death of his brother at Ypres (I'm sure most of us have family connections to this crucial period of the Great War). As the plot unfolds the action switches between 1916 and 2016…. and that's all I can really tell you at the moment, because even I don't know how it is going to end (although it's reassuring to know that there is another Jayne Sinclair mystery in the works!). You don't need to have read the first book to enjoy this one, but since my review of The Somme Legacy won't appear until the next newsletter you've got plenty of time to catch up. I've also started reading The Grass Roots of English History, the latest and - sadly - the final work by David Hey, Emeritus Professor of Local and Family History at the University of Sheffield, who died last year shortly after completing the book. The scholarly nature of the volume is evidenced by the 16 pages of bibliography, but it's nevertheless crammed with insightful information about the world that my ancestors - ordinary people, not nobles or clergy - inhabited. If you live in the UK then this year (2016/17) is the first tax year that the new Savings Allowance has applied - it offers the opportunity to earn up to £1000 in interest without incurring any tax liability (note: the limit is £500 if you’re lucky enough to pay Higher Rate tax). But how can you earn £1000 in interest when the rates are so low, typically less than 1%? You'd have to have over £100,000 on deposit to earn that much in a year! For the rest of us the chance of earning £1000 seems slim - unless you consider peer-to-peer lending. I typically earn about 3% on 30-day investments with Ratesetter - and if you follow this link you can get a £100 bonus by investing £1000 or more for at least a year. I've also invested with Zopa - nothing like hedging your bets - and whilst your money will be lent for up to 5 years you can choose the Zopa Access option which enables you to get your hands on your money if you need it. Again you can earn a £50 bonus by following this link and investing £2000 or more. As usual I'm obliged to point out that I'm not a financial adviser - I'm simply telling you what I do myself. Peer-to-peer lending isn't as safe as putting money in the bank or under your mattress.